Whether you prefer felines, canines, or equines...we have the sign for you! Check out our selection of dog signs, cat signs, and horse signs! 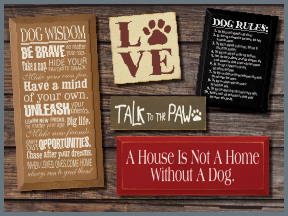 Our pet signs also make great gifts for dog lovers, cat lovers, and horse lovers! With over 40 colors to choose from, your solid wood sign from Sawdust City will look great anywhere! My windows aren't dirty, that's just my dog's nose art!